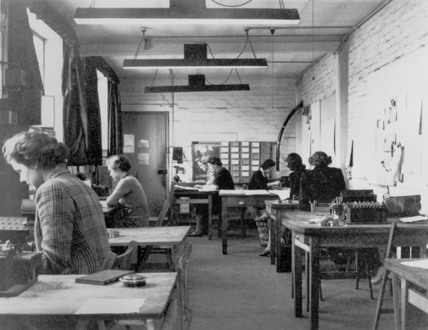 This shows the machine room in hut 6 of Bletchley Park, Buckinghamshire, the British forces' intelligence centre during WWII. The cryptographers at Bletchley Park deciphered top-secret communiques between Hitler and his armed forces. These communiques were encrypted in the 'enigma' code which the Germans considered unbreakable, but the codebreakers at Bletchley cracked the code with the help of 'Bombe' machines. Colossus, the world's first electronic programmable computer, decoded the even more sophisticated Lorenz code, and so aided the Allies' victory.